October | 2013 | Woxford Brewing Co.
I’ve now had two beers go through my 10 Gallon whiskey barrel. The general consensus on used barrels is about three beers and then it’s lost most of the character. I’m looking forward to getting to a neutral barrel so I can start aging sour beers in the 10 gallon barrel. My first beer in the barrel was an outstanding success, a huge Russian Imperial Stout, aged for 2 months in primary and then 3 months in the fresh-dumped whiskey barrel. The finished beer had an hugely mellow oak and whiskey aroma and pulled a ton of vanilla into the rich, dark and creamy RIS. 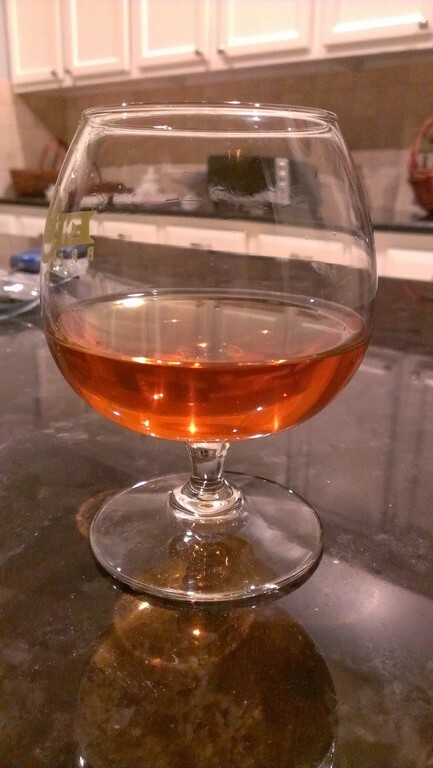 I submitted this beer and received a 44/50 in a competition, also went to the mini BOS round. Not bad for my first whiskey barrel beer. The result is so good that I’ll be repeating this beer again. In fact, I just picked up another 5 gallon whiskey barrel and the first beer in this one will be the RIS again. The second beer into the barrel was a Strong Scotch Ale, ala, Old Chub. This beer didn’t take nearly as long to get the right whiskey level; I’m assuming since it’s a lighter beer that the whiskey comes through faster. This beer is pretty good, but not nearly as good as the RIS. Having 10 gallons of the beer though let me produce some experiments. Half of the batch was bottled. Six bottles were innoculated with Brett. B. Trois, and another 6 were filled with Jester King Funk Metal Sour Stout dregs, and the remaining were bottled with normal sacchromyces. In another month or so, I’ll start testing and tasting these experiments. For the third beer, I wanted to return to something darker. I’ve not yet brewed any porters, so I figured now was a good time. This recipe is based on the BYO style column for Robust American Porter. I’ll have a little extra to keep in a keg to compare with and without the whiskey aging. Hold Chocolate and Black malt out from mash, mix in during mashout. 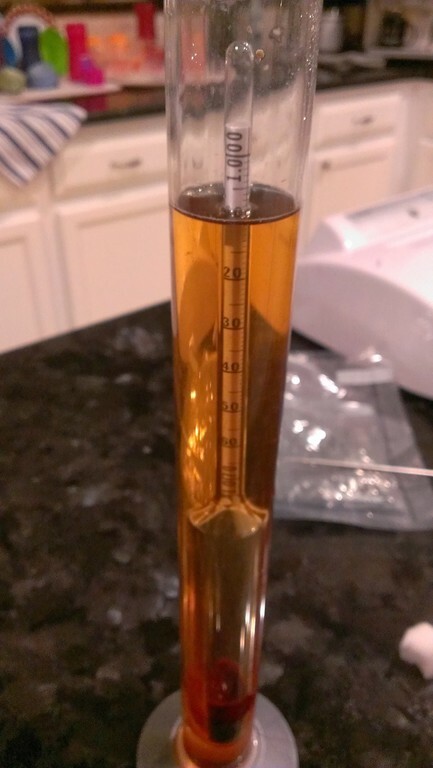 After 3 weeks in primary we’re down to 1.008 @ 74F, about 1.010. Things have been a bit busy, but while I was getting ready for brewnight tomorrow I wanted to check in on the ESB from last time. The sample pulled is brilliantly clear. The aroma is intensely fruity. Classic 1968 bready fruit esters with some more tropical notes, thanks to the Brett B. Trois. I’ve now tossed in about 1 oz of Fuggle to finish it off before it gets kegged. I may also bottle some and carbonate with more Brett B. Trois to see how it compares to the fresh keg later on. I’m really excited, another excellent beer with brett! This gravity sample went down really quickly.